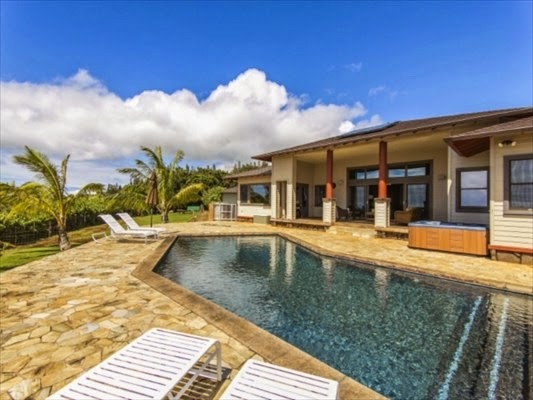 Own this tastefully designed home to truly enjoy Kauai's lifestyle. Appreciate the careful attention to detail and spaciousness immediately as you enter. Once inside, the impeccably maintained home is sure to impress. Your family chef will love you. The living area easily transitions to the outdoors where the expansive ocean view takes your breath away. And if that’s not enough, hold your breath as you take in the sweeping mountain views. Relax in your pool or jacuzzi while enjoying the stunning island scenery. This semi-private property is one of two residential estates well situated atop a hill. Minutes to town and world renowned Poipu Beach. And just steps away from the historical Kukuiolono golf course.